Most of us would be hard pressed to see beauty and future use in our computer garbage as we dump it into a skip at WasteServ, but one woman does. Italian architect Anna Gallo has discovered a way to make truly inspirational objects out of those grimy keyboard keys that have had coffee and toast dropped on them for years. In Anna’s hands, recycled keyboards become fascinating accessories. Anna Gallo has been living in Malta for four years having specialised and qualified in Italy in environmental impact and green building. Last year, Anna decided to collect old keyboards and invent something innovative with them. She designs jewellery embedding the keyboard letters in rings, cufflinks, brooches and earrings. Ctrl + N is the official brand of her creations. With the label, Anna wants to show that there is a clear relationship between recycling and re-invention, and that there can be a new, inherent value in an object – creative and aesthetic in the case of her jewellery – that can resonate with the owner-wearer. She calls her work creative recycling: it builds, invents, creates and recreates anew from items that we throw away. Her jewellery is valued not for its high net worth but more in terms of the symbolic, conceptual and artistic value is bestows. ”It’s not about wearing something expensive, but about wearing something truly unique; the fruit of a creative process that liberates us if you like from the mentality of a throw-away society”, Anna explains. I have always been fascinated by the relationship between the complete object and its parts. I love taking things apart to look at them as individual pieces and to see the parts as complete items in their own right. I believe that the real value of fragments of things lies in their reinterpretation. Thanks to this process of re-reading the objects around us, it is possible to come up with ideas for them that are very different from their role as constituent parts of a whole object. I like the challenge of reinterpreting individual items taken out of their regular context. 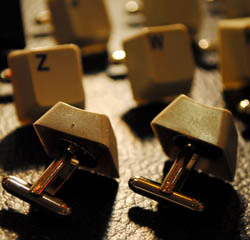 And computer keys hold a kind of individual magic; one that doesn’t weaken even when they are grouped together. It started in 2011 by chance really. I heard that the US Embassy was transferring from Floriana to its new site in Ta’ Qali and thought to myself that it must be throwing out a lot of stuff in the move. I phoned up and managed to get five computer keyboards. To be honest, I wasn’t really sure what to do with them! But, I just couldn’t get my head around throwing them away. So, I began taking them apart and looking at them from a different perspective as they lay in pieces. The idea of creating some sort of accessories got me excited and I started to experiment. The feedback I had spurred me on and my work has been gradually gaining traction. I’ve been invited to the ‘Festival del Riciclo’ in Milan this summer. I get calls almost daily from companies, factories, schools, ministries and individuals who are keen to pass on to me their old keyboards, content to be contributing to an innovative recycling initiative. Why the name Ctrl + N? When you press those two keys at the same time, you open another window. The message is therefore this: with Ctrl + N, you open a new window, a new perspective, a new way of seeing things around you and you are also placing a value on the themes of recycling and creativity. What type of people wear your creations? I would say that my clients are generally people who aren’t afraid to risk, to push the boundaries. People who like irony and don’t take themselves seriously, but who also feel themselves very much in tune the times. They live a use and throw-away life on the one hand, but also try to do their bit to think green and recycle. What I particularly love is sensing the moment in which they understand the philosophy behind my pieces. The exact moment in which they move from viewing the jewellery superficially to finding its irony and value as a deconstructed part reintepreted into something new with its own value and lifeblood. The moment they turn around and smile! I have fun seeing the why clients choose certain keys over others. Some choose their initials, but others choose keys that are spirited communication to friends, loved-ones or family. For instance, ‘page up’ and ‘page down’, ‘enter’ and ‘esc’ are popular as coded meanings. I had one Italian friend who followed her American boyfriend to the States but was homesick for Italy. She chose ‘Break’ and ‘Home’ on earrings and ‘Italic’ for a ring. She said: “Anna, the next time I go to the US and want to return home to Italy, I’ll tell my fiance’, Marco ‘Break’, I want to go to my ‘Italic’ ‘Home’”. One of the most emotional uses of my jewellery was when a man chose a ring with ‘asterix’ as a parody of a diamond and as a coded way to ask his girlfriend to get engaged. When I saw just how much importance and personal value was being given to the keys, I decided to set the keys in silver mounts, with re-cycled silver that has been worked by hand. Thanks to my innovative way of recycling, I’ve won a grant from the Italian Foreign Affairs Ministry in collaboration with the University for a project I am developing called ‘Paper Sustainability in Malta’. I am creating a new line of green stationery products reusing old advertising and billboard posters to create diaries, block notes, sketches books, notepads for conferences and placemats for restaurant and wine bars. I’ve been collecting old adverts for some time now and am in the process of working up designs for packaging, logos and so on. The only thing you can’t recycle is the wasted time!